To get very far he was going to need a lot of books. B is for Books. He could find plenty of big words in a pile of big books. He was ready for anything. You can write books about anything. For instance, fruits. The first page could be a banana and the second page could be an orange and the third could be cherries, and like that. 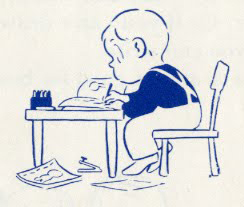 If you can’t write yet, you could just draw. Then the book could be especially for someone who can’t read yet. — Ruth Krauss, “How to write a book,” in How to Make an Earthquake (1954), illustrated by Crockett Johnson, p. 27. We take CARE of our TOYS. We do not want our toys to become broken. We want to keep our toys for along time. Cousin Stinky has come over to play. “Where are your toys?” he asks. “What is ‘TOYS’?” we ask. 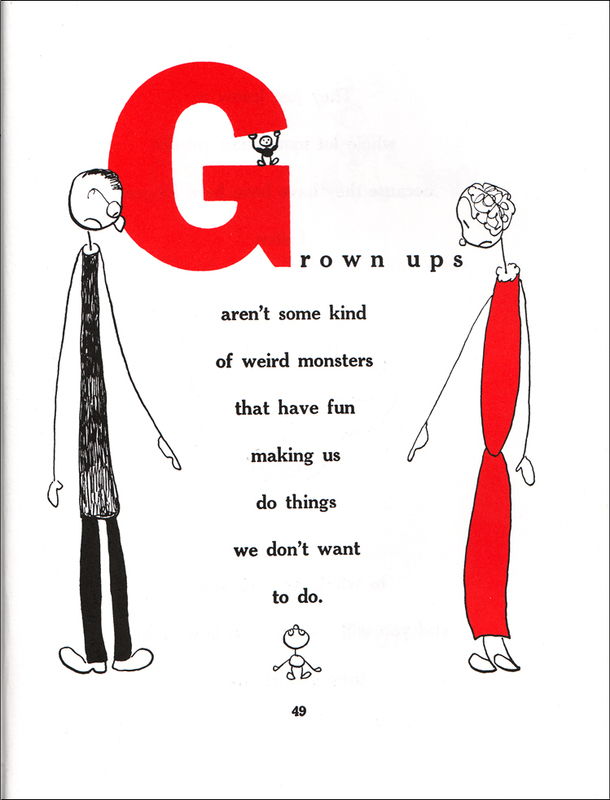 Grown ups aren’t some kind of weird monsters that have fun making us do things we don’t want to do. They just know a whole lot more than we do because they have been here longer. You must never feel badly about making mistakes, as long as you take the trouble to learn from them. For you often learn more by being wrong for the right reasons than you do by being right for the wrong reasons. “Do you like educational games?” Hodgkins asked cautiously. “I love them!” said the Nibling. I sat down and didn’t know what to say. Hodges is considered by many to be the finest pastry chef in the city. Too bad his duck is so crazy. The Scarecrow was now the ruler of the Emerald City, and although he was not a Wizard the people were proud of him. “For,” they said, “there is not another city in all the world that is ruled by a stuffed man.” And, as far as they knew, they were quite right. Yes, that last one was in honor of today’s midterm elections here in the U.S. And, of course, one could add many more quotations to this list. Among those who ought to be represented here are: Francesca Lia Block, Dr. Seuss, Terry Pratchett, Neil Gaiman, Langston Hughes, Florence Parry Heide, J.K. Rowling, and the list goes on and on! Do feel free to add your own below. thanks for reminding me about Friday Night at Hodges’ Cafe. It’s one of those books I love but often forget about. I think I’ll read it to my class today before I it slips my mind. I actually used to keep a commonplace book, years ago. I wonder if I have any children’s lit quotations in it? I’d have a terrible time doing this myself, but it’s really fun to read yours. Glad to have seen your site! I keep Word documents of quotes from books so I can actually find quotes when I need them. Here are a few quotes from my kidlit document that I’d like to share. Thanks for these posts, I’d like to see what other quotes people share! I like quotes so much, I made a whole blog of them. Though as I’m going through a divorce, they have tended toward spiritual and inspirational quotations. Though you can get a nice selection if you click on the “Books” category. Your selection of quotations is wonderful! I was especially delighted with the Wizard of Oz quotation. As it happens, that was on the very page that I got to read in the audiobook project to produce the entire book, read by hundreds of different voices.